Vintage Tom Cat Lemon Citrus Fruit Crate Label Print. Reproduction of the original from Orosi Foothill Citrus Association, Orosi, Tulare County, California. Image of a tom cat. Vintage Tom Cat Lemon Citrus Fruit Crate Label Print. Orosi Foothill Citrus Association, Orosi, Tulare County, California. This is a fine 1970s version of a very popular and extremely rare 1920s image. Printed on highest quality stock soft gloss paper. Actual image dimensions are approximately 8.5 x 12.5 inches. We usually do not sell prints or reproductions. However, the original label and the prints are so popular we thought you might like the opportunity to obtain a print of the original crate label. 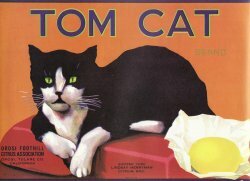 This is a reproduction of the original Tom Cat Crate Label. Crate labels were colorful paper labels used for many years to identify and advertise the growers, shippers, packers and were affixed to wooden crates of fruit or vegetables.